Our success in this infrastructure programme will certainly take Africa to another level. There is a desperate need to fast-track the implementation of the infrastructure projects under the Programme for Infrastructure Development in Africa and the Presidential Infrastructure Champion Initiative. Speaking during an intervention during the African Union/New Partnership for Africa’s Development Heads of State and Government Orientation Committee Summit in Addis Ababa, Ethiopia, on 26 January 2013, President Jacob Zuma said a sense of urgency was required and it could not be business as usual. South Africa launched its Campaign for Accelerated Reduction of Maternal Mortality in Africa (CARMMA) strategy in May 2012. South Africa is committed to doing everything it can to decrease maternal and child mortality and to improve the lives of women and children, both in our country and on the continent. Speaking during a high-level event on CARMMA on 27 January 2013, President Jacob Zuma outlined South Africa’s five-year strategy to deal with children’s and women’s health and nutrition. These interventions include strengthening family planning, continuing with the programme of eliminating mother-to-child transmission of HIV, strengthening maternity services, training doctors and nurses, as well as training more midwives and advanced midwives. The President said that despite progress since 2009, HIV still contributed to about 40% of maternal and child deaths in South Africa. He outlined the expansion of the HIV programme through the mobilisation of millions of South Africans to test for HIV. More than 20 million people have taken the HIV test since 2010. The year 2013 marks the jubilee for the African continent as the Organisation of African Unity will celebrate 50 years of existence, 11 years since the launch of the African Union (AU) and a decade since the continent established the African Peer Review Mechanism (APRM). "One of the major achievements of the APRM and a source of pride for all of us is that it is a truly organic and home-grown initiative of which we should be proud. This year provides us with an opportunity to reflect on the successes, challenges and way forward as we seek to strengthen the APRM." Addressing his peers during the recent AU Summit in Addis Ababa, Ethiopia, on 26 January, President Jacob Zuma said one of the critical issues was the phenomena of youth unemployment. According to International Labour Organisation estimates, of the total of 200 million people unemployed worldwide, 75 million, or around 40%, are young people. If the estimated 152 million young people living on less than one US Dollar per day were added, the number of youth in an extremely vulnerable situation would be 225 million. In South Africa, the unemployment rate is 25% and the majority, over 60% of the unemployed, are under the age of 35. The President outlined South Africa’s multipronged strategies aimed at increasing employment opportunities for young people and fostering social cohesion. South Africa remains on track with preparations for the fifth Brazil, Russia, India, China, South Africa (BRICS) Summit scheduled for March 2013 under the theme “BRICS and Africa: Partnership for Development, Integration and Industrialisation”. At the 20th Summit of the African Union (AU) Assembly from 27 to 28 January 2013, President Jacob Zuma announced the convening of the first “BRICS Leaders-Africa Dialogue Forum”. This dialogue will focus on unlocking BRICS-Africa potential for cooperation on infrastructure. The Chairperson of the AU, the Chairperson of the New Partnership for Africa’s Development (NEPAD) Heads of State and Government Orientation Committee and the Chairperson of the AU Commission have been invited to the summit. The heads of state/government chairing the eight African regional economic communities (RECs), the executive heads of the RECS, the heads of state/government within the NEPAD Presidential Infrastructure Championing Initiative and other relevant regional and international organisations’ representatives have also been invited. As part of the build-up towards South Africa's hosting of the summit, government is conducting a series of roadshows in all nine provinces. The purpose of the roadshows is to raise awareness around the importance of South Africa's membership of the BRICS bloc and the benefits thereof. The first of these roadshows took place on 23 January 2013, in Polokwane, Limpopo. South Africa remains committed to providing humanitarian assistance to the Sahel region. On 20 March 2012, government announced that South Africa would be providing emergency humanitarian assistance to the Sahel as per request of the governments of that region. Following the successful delivery by air to Niamey, Niger, between September and December 2012, of 440 t of nutrition for children (maize power boost), 100 kg of bio-pesticide and 12 000 protection kits for the application of the bio-pesticide, a further consignment has reached Cotonou, Benin, by sea. On 18 January 2013, 873 t of fertilizer (16 206 bags), 2 597 t of animal feed (4 058 bags) and 110 t of maize power boost nutrition (4 305 bags) arrived in Cotonou and is currently en route by road to Niamey. A final consignment of 1 000 t of animal feed and 5 t of summer oil for the application of the bio-pesticide will leave Durban harbour for Cotonou by the end of January 2013. The President of the Republic of Niger, Mahamadou Issoufou, visited South Africa in November 2011, after which a task team visited Niger to investigate its needs at the request of the Government of Niger. As a result, the Minister of International Relations and Cooperation, Maite Nkoana-Mashabane, announced in March 2012 that South Africa would assist with emergency aid to various countries in the Sahel, including the Republic of Niger. All the aid for Niger has been sourced in South Africa, with the uniforms for the protection kits being manufactured by a women’s cooperative. The maize power boost is an enriched maize product, also produced locally, and the animal feed is a blend of materials suitable for animals living in the extreme conditions of the Sahel. The bio-pesticide requested by Niger is a product developed specifically for the desert locusts of the Sahel and was developed recently, with the participation of South African experts. South Africa remains concerned about the deteriorating humanitarian situation throughout the Sahel region. Over 15 million people, including 3,5 million Malians, across the Sahel have been affected by the food and nutrition crisis since 2012 and over one million children are at risk of severe malnutrition. The recent insecurity in Mali has exacerbated this crisis. Internally displaced persons and refugees are continually arriving in drought-affected areas where food insecurity forecasts are among the worst in the region. South Africa is currently working with the Malian authorities to deliver the South African-sponsored humanitarian aid package as per the request of the Malian Government. Details of the delivery of the aid package will be announced in due course. South Africa will continue to support efforts by the Economic Community of West African States, African Union and the United Nations to restore peace and security in Mali. The award celebrates "artists who not only excel in their art but also help to improve the world". South African-born and -raised actress and United Nations Messenger of Peace, Charlize Theron, received a special award at the opening of the World Economic Forum's annual meeting in Davos, Switzerland, as one of three “exceptional cultural leaders”. Hilde Schwab presented the Schwab Foundation for Social Entrepreneurship's Crystal Award 2013 to Theron, United States artist Vik Muniz and Pakistani documentary filmmaker Sharmeen Obaid Chinoy. South African singer and humanitarian Yvonne Chaka Chaka received the same award in 2012. 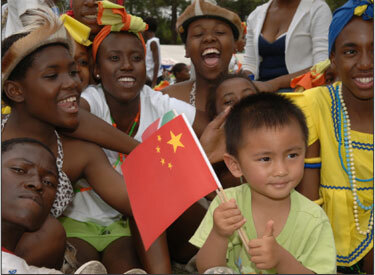 Over 96 000 Chinese tourists visited South Africa between January and September 2012, up from the 59 187 who visited over the same period in 2011. Growth in South Africa's tourism sector from its Chinese market boomed in 2012, increasing by 63,5% between January and September, making China the country's fourth-biggest overseas tourist market. "China is now one of South Africa's most important and valued partners for tourist arrivals and a market the South African Government is committed to investing strongly in”, the Department of Tourism said in a statement. To build on the relationship between the two countries, the Minister of Tourism, Marthinus van Schalkwyk, left for a media roadshow of China on 23 January 2013. 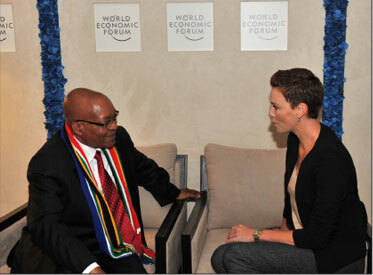 His activities will include sharing details on South African Tourism's 2013 marketing plans in China.